In press, in the Journal of the American Chemical Society. To answer a student question (on the first day of class, no less) about the geometry/sp3 hybridization of carbon in my 2nd semester organic chemistry class, Prof. Baldwin began by writing the time-independent Shroedinger Equation on the chalkboard. Needless to say, the wavefunction that was my future collapsed instantaneously. To summarize considerable computational effort (and ignoring many, many equations you can find in the paper), the shifts in hydrogen (H) peak positions in the 1H NMR spectrum of cyclohexane that result from deuteration (D) can be explained by considering the contribution of the vibrational stretching mode differences of the C-H and C-D bonds. Interestingly, the trend determined from the computational studies is fairly insensitive to the use of electron correlation methods (B3LYP, MPW91, MP2 were all employed with 6-31++G(2d,p), 6-311++G(2d,2p), and Aug-cc-pVTZ basis sets), with Restricted Hartree-Fock (RHF) results very similar and much faster to calculate. The RHF results served as the basis for the analysis in the paper. The geometry optimization of a molecule will provide you static bond lengths (C-H, C-D, C-C for cyclohexane). In the case of just the optimizations, H and D look identical to the electronic wavefunction (the basis of the Born-Oppenheimer Approximation). If the bond lengths stretched like harmonic oscillators (the approximation we almost always use when performing normal mode analyses in quantum chemical codes), the calculated bond lengths would be the correct (physical) average bond lengths. Of course, no chemical bond is a perfect harmonic oscillator, a fact that explains transition probabilities for overtone and combination bands that are forbidden within the harmonic approximation. 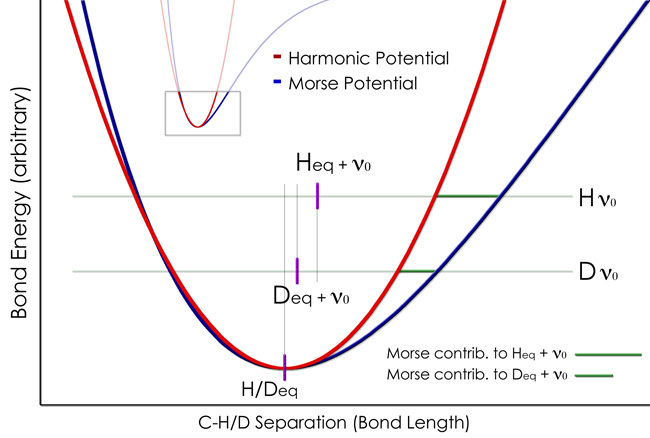 For atom pairs that stretch with a significant anharmonic character (such as C-H/D), the actual description of the bond length is a very important factor to consider when trying to extract important trends based on the actual bond length behavior, and is as described in the figure below. This figure shows the bottom of the potential wells for idealized harmonic and Morse oscillators. The figure, like the paper, only considers the contribution from the vibrational zero-point level (v0). The Heq/Deq position at the bottom of the potential wells is the calculated bond length after geometry optimization. If the stretching potential is harmonic (red), the average position of the H/D atom is always at this position regardless of the system energy (the H atom is sampling as much of the short-side of the potential as it is the long-side, which, you guessed it, averages to the middle). Now consider the anharmonic oscillators (our Morse functions). The H atom, being lighter, has a higher vibrational zero-point energy (VZPE). Its average position (or mean displacement from the C atom) due to VZPE (Heq + v0) is slightly longer. The deuterium, with twice the mass, has a lower VZPE. As a result of lying lower along the Morse potential, its average VZPE-corrected position (Deq + v0) is closer to the calculated static position than for H. The difference in the contributed length to the average positions is shown in green. This position-based description is really just for show and neglects all of the quantum theory, but it does make the point. You can consider the green to be the effective additional distance within the Morse potential that the two atoms sample compared to the harmonic potential as part of their stretching mode, with the average position differing due to this larger spatial sampling in each oscillation. So, “real C-D” is shorter than “real C-H”. Accordingly, the 1H NMR peak position of C-H in the presence of C-H bonds (which are further away) is different than in the presence of C-D bonds (which are closer). This is also the first paper I’ve been on that did not directly involve my making an image (hence the involved image above). Abstract: The substitution of a deuterium for a hydrogen is known to perturb the NMR chemical shift of a neighboring hydrogen atom. The magnitude of such a perturbation may depend on the specifics of bonding and stereochemical relationships within a molecule. For deuterium-labeled cyclohexanes held in a chair conformation at -80oC or lower, all four possible perturbations of H by D as H-C-C-H is changed to D-C-C-H have been determined experimentally, and the variations seen, ranging from 6.9 to 10.4 ppb, have been calculated from theory and computational methods. The predominant physical origins of the NMR chemical shift perturbations in deuterium-labeled cyclohexanes have been identified and quantified. The trends defined by the Î”Î´ perturbation values obtained through spectroscopic experiments and by theory agree satisfactorily. They do not match the variations typically observed in vicinal JH-H coupling constants as a function of dihedral angles.